Just like a pizza can’t be baked without the dough, or a car can’t be constructed without a frame, most products won’t be of use to anyone without a sound foundation. A good’s usability, utility, and durability are, more often than not, tied to the quality of the foundation or system they are built upon. This is true of large- and small-scale products alike, and one product with a foundation we rely on every day is our bed. This need for a quality foundation is particularly important for foam mattresses, a product built on the premise of ultra-comfort. Foam mattresses – which encompass conventional, memory foam, and latex foam varieties – are able to contour and mold to our bodies, providing a custom sleep surface that relieves pressure and eases aches. But as foam is a more yielding, fluid material than traditional bedding, the influence a foundation can have on the bed is substantial. To prevent your bed-build from negatively impacting your sleep, there are a few foundation strategies worth implementing that can keep a mattress in great shape for years, while giving you superb comfort and support. With foam’s flexibility, it’s very important to ensure the foundation a foam mattress is placed on is firmer than the comfort layer. This is easily handled when using a box spring or platform bed since these rigid bases will always be harder than foam, but if implementing a layered foam mattress setup, the answer is not necessarily obvious. A firm foam base provides a bed with stability and support, while softer comfort layers provide the contouring benefits of foam bedding. 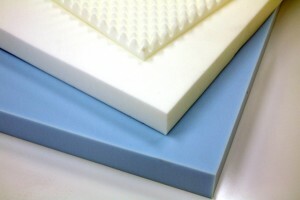 This is particularly important when using thinner sections of foam, such as mattress toppers. Products like The Foam Factory’s memory or eggcrate topper are designed to compress under higher pressure areas, making for excellent comfort. But without a firm and stable foam beneath it, that comfort is lost as the thinner topper will bottom out. This is why toppers feel wonderful when used properly on mattresses, but feel like nothing is there if placed on the floor. On thick mattress setups, a soft foam foundation will make for a poor sleeping surface as well. When firmer foam is placed atop softer foam, uneven pressure distribution makes foundations compress to the point support is lost. When building a multi-foam mattress setup, always look for higher density foam to ensure quality, and order materials so the firmest foam, indicated by higher Indentation Load Deflection values, is placed on the bottom. The Foam Factory’s Dunlop latex mattresses, Lux-HQ, and HD36-HQ foam varieties all make fantastic foundations for layered mattress builds and varying comfort preferences. Another, more traditional bed-build is placing a single, thick foam mattress layer on a box spring or a slat-foundation. This method works well for individuals who desire a firm bed with the comfort of foam, but the build of box springs and the placement of slats can impact the long-term condition of a foam bed in ways that may be overlooked. When using a foam mattress on a box spring, it is imperative that the box spring is either new or in excellent condition. Since a non-layered foam mattress is composed of one single sheet of foam, damage to the foam in just one area can spiral into a fully damaged and unusable mattress surprisingly quickly. Split or chipped wood, exposed nails or staples, and even exceedingly thin boards can rip, scrape, or puncture foam. These minor issues can quickly grow in size until they’re noticeable. At that point, the mattress is compromised to the point it can no longer provide a fully supportive sleep. With slats, the same advice regarding appropriately sized, undamaged materials also applies. The other consideration to take with bed slats is their spacing. 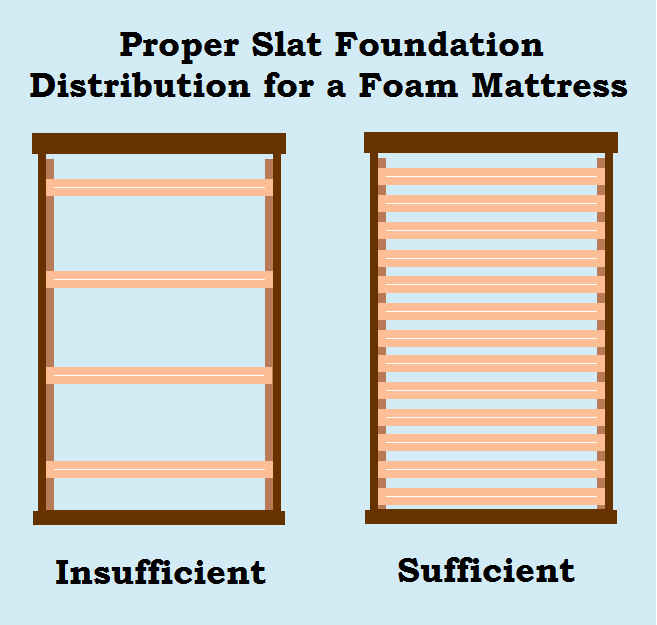 Using too few slats leaves sizable gaps in a foundation, which can cause a foam bed to sag, bow, or even rip from the pressure. 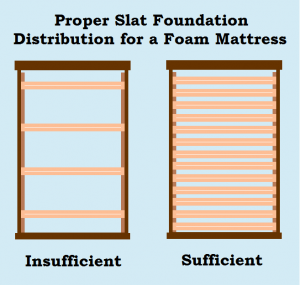 The more closely slats can be positioned, the more support a foam bed setup receives, which is better for support and the longevity of the foam itself. Foam mattresses provide some of the most refreshing and restful sleep experiences possible. But like most things, the top products start from the ground up. In the case of bedding, that means utilizing smart, solid foundations.